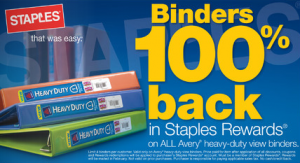 Free Binders at Staples 1/9-1/15! January 8, 2011 · by Zack & Katie · Post may contain affiliate links. See my disclosure policy here. Well, it appears that Staples took the idea from Office Max and ran with it (or vice versa). For the week of 1/9-1/15, all Avery binders at Staples will be free after getting 100% of your purchase price back in Staples rewards. Go here to learn more about Staples Rewards.